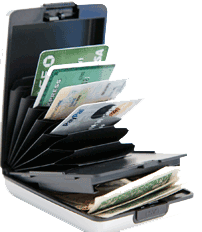 Effective RFID protection / Elegant Euro design wallet: Now theives do not need to get to the strip on your credit card or identification; all they have to do is stand innocently within a few feet from you, and use a Radio Friquency gadget to get all of your information. With that information they can make duplicate credit cards and identification, then clean you out. The results are disasterous and it can take years for you to recover and clear your name.